Black Sheep is set in the idyllic countryside on a sheep farm in New Zealand featuring a farmer and his sons Henry and Angus Oldfield. Things soon turn nasty as Angus, jealous of his younger brother kills Henry’s pet sheep before tormenting him with the sheep’s still bloody skull. Moments after the boys then learn that their father has died in an unspecific farm accident. The film then fast forwards fifteen years and we again meet up with Henry, now an adult played by Nathan Meister (Avatar, The Adventures of Tintin), as he returns to his home farm. The incident witnessed at the opening of the film has left Henry with a pathological fear of sheep, something that is a large issue when visiting a sheep farm! Indeed, the first shot of the older Henry is him cowering in the back of a taxi surrounded by a flock of sheep. The older Angus, played by Peter Feeney (30 Days of Night) is still the same piece of work that scared his younger brother wearing a sheep’s head and is now running a laboratory experimenting on genetically modified sheep. One of the genetically modified lambs, or rather sheep embryo in a test tube, is released by two hapless animal rights campaigners, Grant (Oliver Driver) and Experience (Danielle Mason), which subsequently attacks Grant before moving onto the field of sheep nearby. Unfortunately for Grant it appears that the ‘mad sheep disease’ is not only communicable between sheep but also to humans, turning the human victim into a sheep. Living alongside Angus on the farm is Mrs Mac, who incidentally is the person who shares the bad news of their father’s death with the boys in the first scene, and Tucker (Tammy Davis). Whilst showing Henry the farm, Tucker and Henry come across Experience and with her the infected sheep. The film then follows the three of them as they battle the genetically modified sheep and search for a solution to the spreading problem. As with all comedy films there are a number of unrealistic scenes (putting aside the premise of killer sheep), including a sheep driving a pick-up truck over the edge of a cliff and a scientist being attacked by sheep next to the offal pit where they dispose of the remains of their experiments. I think sheep lend themselves very well to this premise with their blank staring eyes meaning it is very hard to tell which sheep is infected and which is not until it attacks. The undeniable stars of the show are the demonic sheep, particularly the evil lamb that is responsible for the outbreak, created by Weta workshop who shot to fame after producing the special effects for The Lord of the Rings Trilogy. Black Sheep is a satisfying romp around the New Zealand countryside providing just the right balance of gore, laughs and plot. The one negative to this film is their representation of scientists as megalomaniacal psychopaths with no respect for either animal or human life. On the other hand, the writer and director Jonathan King (Under the Mountain, The Tattoist) is equally scathing of the animal rights protestors, portraying them as deluded hippies who spout long rhetoric spiels at the drop of a hat and carry around geranium candles to ‘balance their hormones’ so it is clear that King takes neither view particularly seriously. 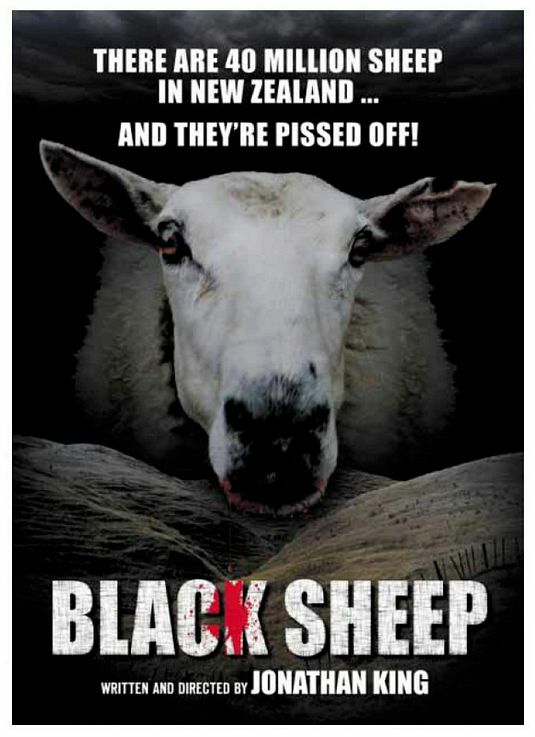 I definitely enjoyed Black Sheep and was surprised at the level of realism in the sheep (I was expecting something along the lines of The Deadly Bees. Fun Fact: The scientific word for a phobia of sheep is ovinaphobia. Dead Kids, or as it was later released, Strange Behaviour begins with the murder of a teenage boy in a black out. The first scene is a good set up for the feel of the film with a clever but unrealistic use of silhouettes to show the murder and a callous radio show presenter commenting on the drowning of several local teenagers. The film focuses around the Chief of police, John Brady played by Michael Murphy (Batman Returns, X Men: The Last Stand) and his son Pete, played by Dan Shor (Bill & Ted’s Excellent Adventure, Tron). Pete is an A grade student and needs to earn some quick cash for an application to the local college. On the suggestion of his friend, Pete volunteers to take part in a psychological study conducted by Dr Gwen Parkinson (Fiona Lewis) furthering the work by the deceased Dr LeSange (Arthur Digman). Dr LeSange, although dead still has a significant presence at the university with a dedicated office and presenting lectures via old films. It also transpires that there is history between John Brady and LeSange with Brady holding the doctor responsible for the death of his wife who was the doctor’s assistant. As the body count increases, it becomes clear that the murders are not being perpetrated by the same person. With a brief description of the killer and the identity of the victims who are all children of the people who first investigated the immoral experiments of LeSange, Brady is led to think that the scientist is not as dead as first thought. Although the film is made in New Zealand, it is set in Galesberg, Illinois and the whole cast are American actors, giving it the feel of a typical American film and as such has all the expected hallmarks of a Hollywood slasher flick including horrible surprises behind shower curtains and teenagers being murdered whist getting busy in the back of a car. Incidentally Illinois is where the director, Michael Laughlin (Two-Lane Blacktop) grew up. The soundtrack is typically 80s and comprises of electronic music, including music by Tangerine Dream and Pop Mechanix. The film has a soft focus look around the edges adding to the feeling of mind control and losing control that is central to the film. The films finale is astonishingly tense and a great climax, although not wholly unexpected. The film rattles along at a fast pace, as it should being only 87 minutes long. Dead Kids is a not your usual horror film with an unusual plot and a lack of morality. Whilst some of the ideas may not be particularly believable, such as the spontaneous set dance at the party, I think that this is an underrated film from the era and I would recommend it to anyone. 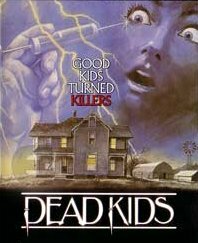 Dead Kids was originally intended to be the first in Laughlin’s Strange trilogy, however the third and final film was never made after the poor box office success of the middle film, Strange Invaders and after having watched Dead Kids/Strange Behaviour, I will be on the lookout for a copy of the second film. Fun Fact: The teenager murdered in the very first scene is played by the screen writer Bill Condon, who went on to write the screenplay for Chicago and directed the final two Twilight films.